Voulez Vous is “do you want” in French. So voulez vous a French bakery to complement your delicious cup of coffee? If so, here’s your spot. Half of our Nutella crepe! 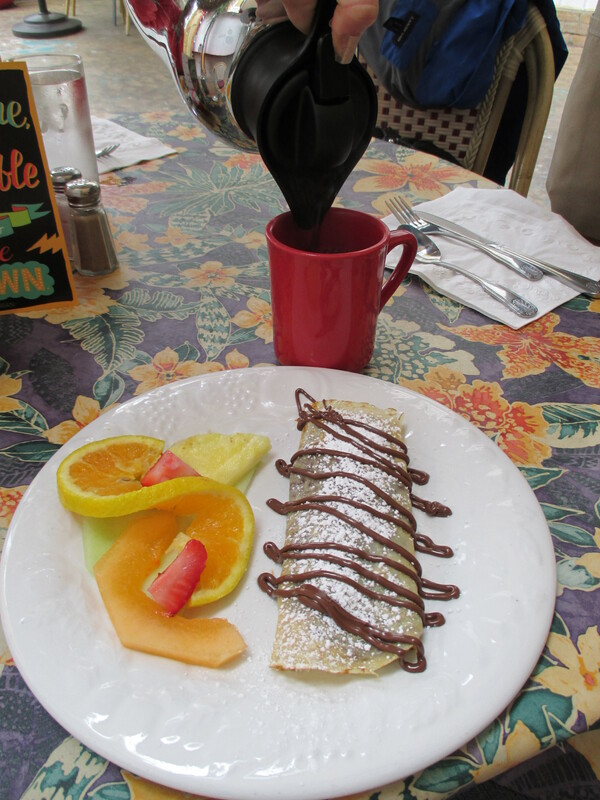 We originally went to Voulez Vous for crepes and coffee to celebrate Urban Safaris’s 15th anniversary. We ordered one savory crepe and one Nutella crepe. The kitchen staff graciously split each and served us the savory crepe first and, when we were ready, the Nutella crepe. The photo is half of the Nutella crepe. (Yes! Half!) It’s picture perfect and it was scrumptious. Later I returned and visited the boulangerie (French for bakery) area rather than the restaurant area. Go through the restaurant to the back to find the boulangerie. There you can get cups of coffee to accompany delicious croissants and other French treats. The bistro was established by the Malécot family with son Christian heading the restaurant along with his father, Michel, who is responsible for the well-known French Gourmet in nearby Pacific Beach. When you are finished enjoying your coffee, head to La Jolla Shores Beach, just down the street. This entry was posted in Coffee shops in San Diego, near the beach and tagged crepes, La Jolla, La Jolla Shores Beach. Bookmark the permalink.